A three-year-old, screaming, and her stern-faced mother saying, “Use your words. Find your words.” Where? How? A vortex of nano-particles choking my throat. Holding my breath until I turned blue. A skinny dark-haired tomboy, scowling at the world. I couldn’t spell. I inverted letters on the page. Went became want. Hole became howl. How are you? became Who are you? I struggled to read. I trudged over to the big round reading table in a pissy mood. All my friends could recite aloud, but when it came my turn, I was quickly overwhelmed by the hieroglyphics drifting across the page. My teacher would say, “Try again.” Ugh. I developed a stammer. My father told me not to worry—he’d struggled with reading once, too. He showed me an illustrated book, and inspired, I wrote my own version of Alice in Wonderland. Alice follwo’d the rabbit down a howl. 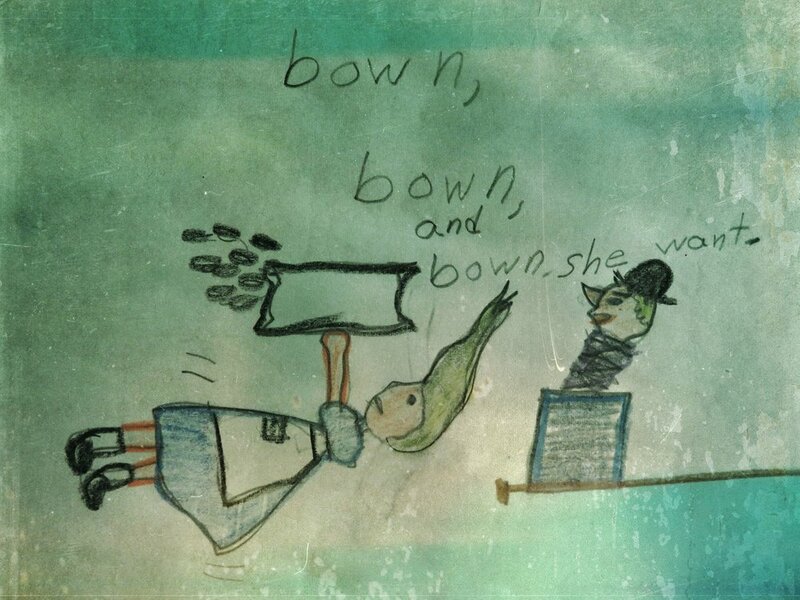 Bown, bown and bown she want. Awkward and lost. A wildness in my eyes. Deathly afraid of failing in school, I finally learned how to read by falling in love with the characters in stories. To this day, I can’t explain why or how, but suddenly I was reading everything I could get my hands on. And my imagination soared. I hated school, but what I really hated was confinement. Dry lectures and big windows with perfect views of blue sky and green grass. My stomachaches sometimes fooled my mother, and I’d stay home and write. Skinny, scrawny, too much makeup caked over the eyes. Self-conscious about my K-Mart clothes. I got my first dictionary. Right away, I looked up dyslexia. My grandfather once wrote me a check for a million-trillion dollars, which I kept in my coat pocket until my mom made me throw it away. On our walks in the woods, he would make up stories about fairies who lived in the roots of trees. Each time I visited, he would say, “You can have any book in my house.” His books were leather-bound and dusty. He’d flip through the pages and read aloud, and I loved the sound of his voice. He gave me confidence. He made me love words. I decided. I would write books. And so I wrote, and when I wasn’t writing, I wasn’t breathing. Pencil-thin, greasy long hair, distracted smile, rebellious. I wrote essays about fruit flies and being a nonconformist. I wandered the halls. I wanted to disappear. Everyone was rushing. Why? A shallow-breather hiding inside my parka. Impulsive girlie-girl. Creative. Curious. I had my core group of friends. We hung out together, majoring in alienation. We wrote and read and talked a blue streak. My first writer’s group. A sullen Bambi lost in the forest. Not always understanding what people were saying but taking things too literally. I attended college in the city, as far away from the woods and the barns and the cows as possible. I took drugs and drank beer and made new friends and enemies. My father’s letters to me—meticulously handwritten—would often have words crossed out, with corrected spellings written above them. And sometimes his corrected spellings were misspelled. I starved myself. I didn’t eat well. I wasn’t sure why. I wrote about my confusion. Cynicism was my core curriculum. I called home, looking for assurance, full of secrets I couldn’t share with my parents. I was thoroughly down the rabbit hole. My mother and I would talk about practical things. Then she would hand the phone to Dad. We no longer spoke the same language. I’d hang up and write about those things I couldn’t say to him—stories about love and childhood and hometown friends and things I missed and dreams I wished would come true. I’m a published author. I still struggle. I’m not sure what my story can teach you. I just never gave up.